You will need a kill switch that has the 4 auxiliary poles. 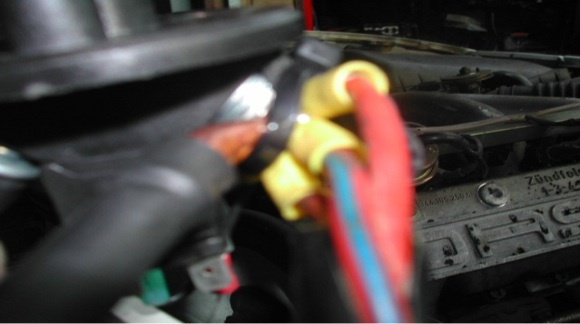 These are used to wire the coil and to absorb the surge from the alternator when the kill switch is used. 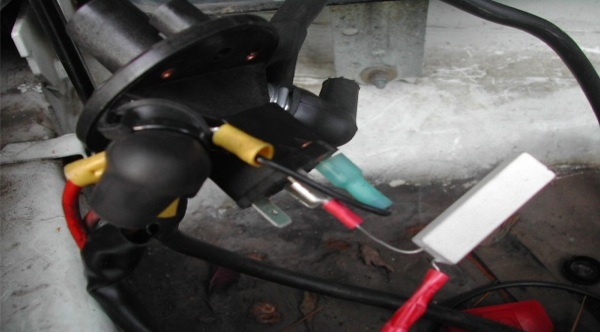 Without this configuration the surge in current created by disconnecting the battery from the alternator can damage circuits. 1) Disconnect the Positive lead from the battery. 2) Determine where you will locate the switch. a) Will you locate the switch itself where it can be operated ? b) If not – How will you setup the switch so it can be operated ? c) How long a run of cable do you want between the battery and the switch. (If this cable is cut/crimped in an accident the switch will not be able to do its job). I decided to mount the switch in the battery compartment and to operate the switch via a cable. This allowed me to run the least amount of new power cable and keep everything in roughly the same area as the factory. A mount was constructed from right angle brackets I had available in the shop. 3) Locate the lead from the DME to the Coil and disconnect it from the coil. This needs to be extended from the coil area up to the switch and back. (Excuse the state of the compartment – we had not finished cleaning up from the Engine Fire that led Pokey into our possession) The first picture shows the original lead being extended up to the battery compartment and the second shows the return. Following the pictures these were covered with sheathing for protection. 4) The second pair of spade terminals are live when the switch is turned off. Connect the non battery large terminal to one of this pair of spade terminals. You will need to make your own jumper cable for this as they do not come with the switch. The other terminal is connected to ground via the resistor included with the switch. This is what carries the spike from the alternator to ground when the switch is used. The picture shows the jumper to the spade connector and the resistor that then is wired to the normal ground point. (Second picture) . Note the spark plug boots used to insulate the large terminals. 5) In the above picture you can see the red activation key hanging on a wire. This is a standard pull cable from the Help section of the autoparts store that was routed to the Drivers side windshield and secure there. 6) Finally you will need to connect the Battery cables to the large terminals. It is easiest to purchase a short battery cable to go from the battery to the switch and then another from the switch to the original battery cable. This should be one with ring terminals at both ends. Use the existing bolt on the original terminal to connect to the new wire and the 3 smaller wires all together. 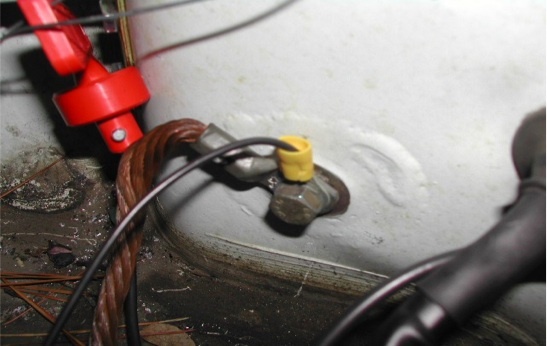 Ensure you completely insulate the cables where they are connected. And then do it again – you don't want to be welding under the hood ! In this picture the original battery clamp had been removed and a ring terminal soldered on. Note how crowded the terminal is – I no longer think this is the best way to connect to the switch. It put a lot of strain on the switch and caused intermittent faults. 7) Connect the switch to the mounting bracket and place the warning sticker where the activation point is.